Need a perfect dish that would work as a brunch item, or dinner? Well, I’ve got one for you! I know recently I’ve done some tarts and frittatas (such as: gluten-free tomato tart, tomato leek & brie tart, squash blossom & bacon frittata), but they are so easy in the summer! And now that it’s (slowly) cooling off, don’t spend too much time in the kitchen and enjoy the last of the summer vegetables. Make this tart! If you’re not a fan of squash or zucchini, feel free to swap for anything else that’s colorful! Add the flour, salt, and baking powder into a food processor. Pulse about 2 times to mix the ingredients. In a small glass mix together the olive oil and water, then slowly pour it into the flour mixture with the food processor on. Process until the dough is crumble. Take it out, and knead it for about 1 minute on a floured surface. Then shape it into a disk and wrap it up with parchment paper. Chill in the fridge for at least 30 minutes. In a large bowl combine the yellow squash and zucchini with olive oil, garlic, salt and pepper. In a small bowl, stir together ricotta, thyme, lemon juice, egg, black pepper, and salt. Preheat the oven to 400ºF. After the dough is chilled, unwrap it and press it into a 9 inch tart pan. Spread the ricotta mixture over the dough. 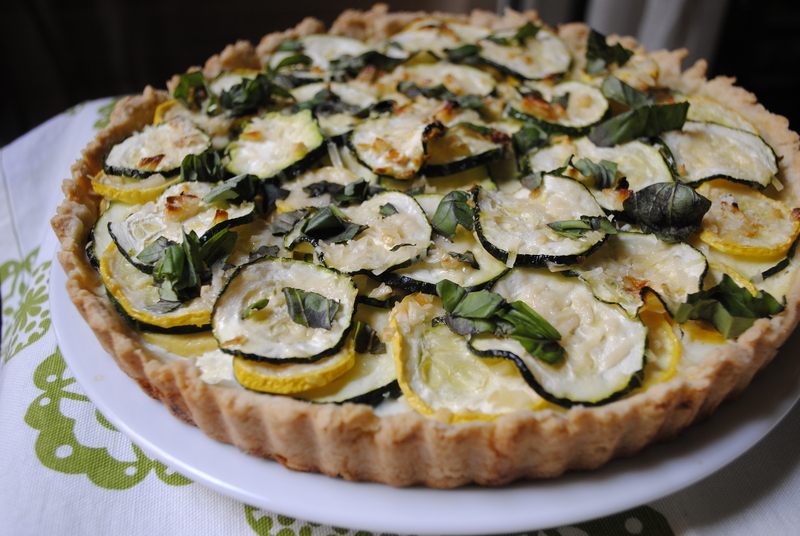 Then arrange the zucchini and squash slices over the tart (there will be a couple of layers). Bake in the oven for 40 minutes, or until the edges are golden brown. Allow to cool, then sprinkle with Parmesan cheese and basil. Cut into wedges and serve. As I mentioned yesterday, today marks the first day of The Food Matters Project. Sarah has chosen the first recipe: Chipotle-Glazed Squash Skewers. * we weren’t in the mood for winter squash (might be due to the warm weather), and decided to use zucchinis and yellow squash. Preheat the oven to 400ºF. Spray a cookie sheet with cooking spray. Crack an egg into one bowl, mixing the yolk and whites together. In the other bowl, pour in the Panko crumbs. 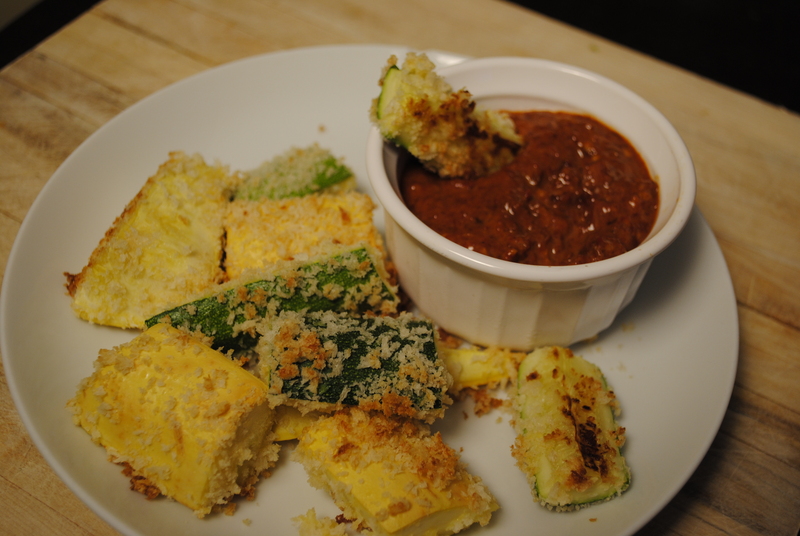 Dip each squash piece into the egg mixture, and then dip it into the Panko crumbs. Continue to do this with the rest of the zucchini and squash pieces and arrange all of the vegetables on a cookie sheet. Bake in the oven for 20 minutes. In a food processor add: chipotle chiles, olive oil, honey, garlic and salt. Processes the mixture until the sauce is well blended. 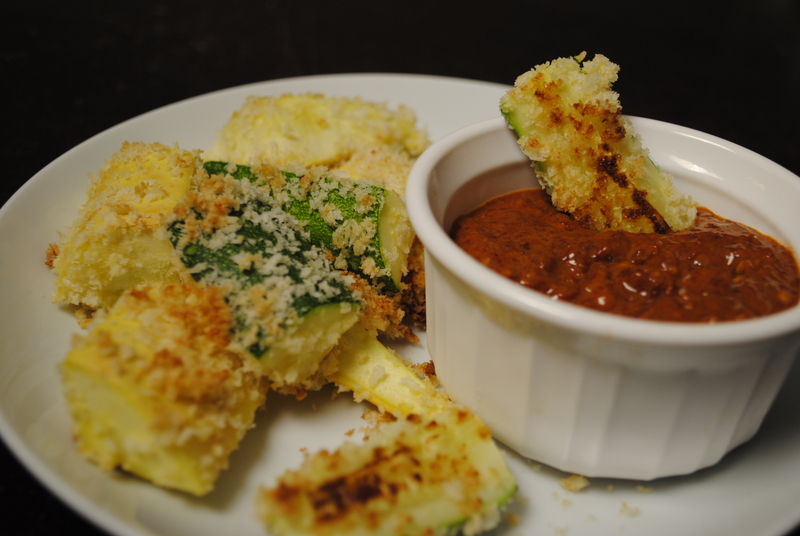 Enjoy each squash or zucchini with some of the chipotle sauce. I apologize for the lack of posts this week. I was actually planning on putting this recipe up on Thursday (Cinco de Mayo), but unfortunately I was not eating Mexican that evening but at a work function. It’s been a busy week! We love Mexican food. We (more like Sam, but I’m getting there) cannot find anything spicy enough in restaurants. So, homemade is usually better since it is spicy enough. In this recipe, we added the adobo chiles and jalapeños in the sauce, but feel free to omit them if super spicy is not your taste. 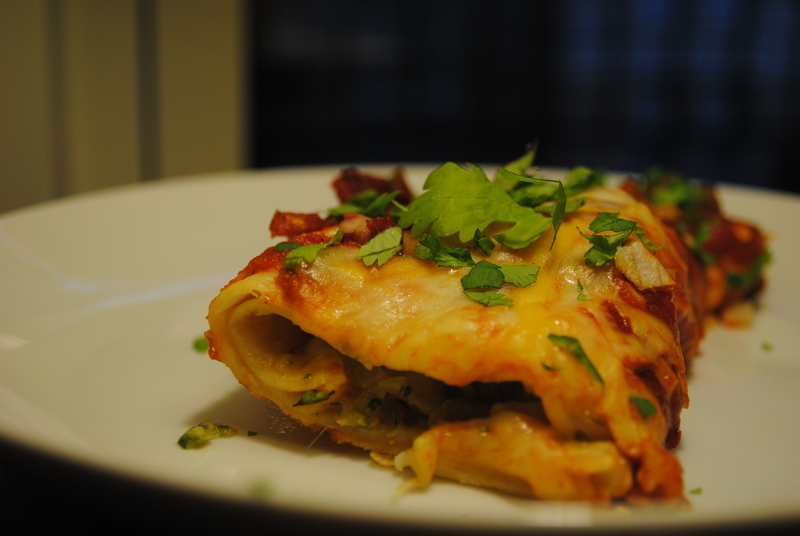 These are excellent vegetable enchiladas, I would have not thought to shred the zucchini before adding it to the dish. But it gives it a meaty and soft texture, even though there is no meat in there. Excellent idea! We plan on making these again, but adding either shredded pork or chicken, we’ll make sure to share it with you! Preheat the over to 400°F degrees. Spray a baking dish so the tortillas do not stick (appropriately sized dish to fit the tortillas). In a medium saucepan, heat 1 tbsp olive oil. Then add 3 chopped garlics and sauté. After a minute add: chipotle chile, jalapeño, 1 tsp chili powder, 1/2 tsp ground cumin, vegetable broth, crushed tomatoes, 1/2 tbsp salt and 1 tsp pepper. Bring to a boil. Then reduce the heat to low, and simmer for 5-10 minutes. Set aside until you are ready to pour over the enchiladas. Either grate the zucchini with a grater or in a food processor. In a saucepan, add 1 tbsp of olive oil. Once it’s heated, add 4 garlic cloves and onion and sauté. Then add the zucchini, green onions, 1/2 tbsp salt, 1 tsp pepper, 1 tsp chili powder and 1 tsp ground cumin. Cook for about 5 minutes. Remove from heat, and stir in 1/2 cup of cheese. Mix well, until the cheese has melted in the mixture. Divide the zucchini mixture between the 4 tortillas. Roll each tortilla and place, seam side down, into the baking dish. Once all of them have been arranged, pour the sauce over the tortillas. Sprinkle the remaining cheese over the dish. Bake until the cheese has melted, and enchilada sauce is bubbling, about 20 minutes. After plating, sprinkle chopped cilantro on each enchilada. Book Club dish #2! This was actually a lot easier to make than I had envisioned. The thought of hollowing out all of those zucchini worried me just a bit. But armed with a teaspoon (we don’t have a melon ball spoon), I did it! Once I got the hang of it, and didn’t break any chunks off, it was done quicker than I thought. Once again Faith, from An Edible Mosaic Blog, gave me the idea which I pushed a little further. She had learned this recipe from her mother-in-law who is living in Syria. 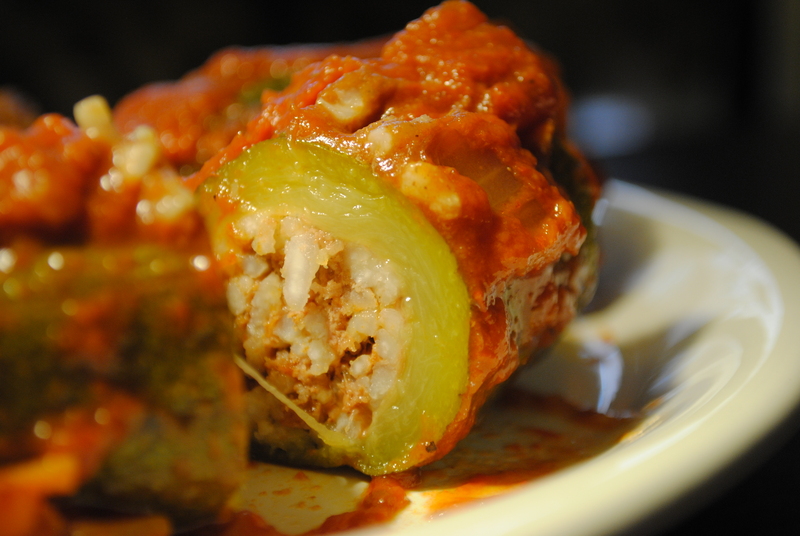 This is a very similar recipe that many people use for stuffed peppers. I added some more flavor to the sauce since I was using canned sauce (tomatoes are not yet in season here in DC, and the one’s from the grocery store taste awful!). Instead of beef, ground chicken or turkey can be used. 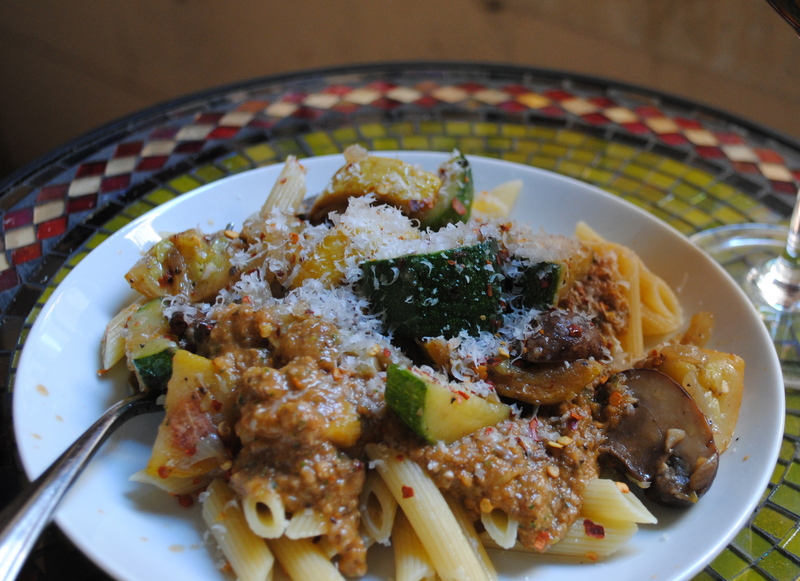 This would be another dish I’d try out for a dinner party, the sauce can be made a day ahead- and the prepping of the zucchini did not take long. I’d say 2 pieces of zucchini per person, especially if there was other food (appetizers, dessert, etc). Then, in a large pot heat olive oil over medium heat. Add the onion and garlic, saute for 6-8 minutes or until soft. Remove 3/4 of the onion-garlic mixture and put in separate bowl. Add a can of crushed tomatoes, tomato paste, allspice, cumin, curry, bouillon and bay leaves into the pot. Also add 1 tsp of salt, and 1 tsp of pepper, as well as 1 cup of water. Heat this sauce over low heat. Once complete, add the stuffed zucchini into the simmering tomato sauce, trying to submerge most of the zucchini into the sauce. Cook on medium to low heat, covered for about 1 hour. The zucchini will be soft once it’s cooked (I took one out to double-check and tested the softness with a fork).